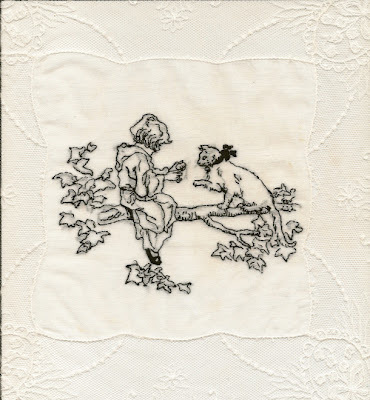 I have a soft spot for embroideries based on illustrations and this one, embroidered by Kate Elisabeth Rolinson (Poesie Grenadine), is particularly lovely. lt's based on an illustration from a children's book from the 1930's. I especially love how delicate it looks, stitched with presumably only one strand of floss on a French Lace hand kerchief. More about this commissioned piece on Elisabeth's blog Poesie Grenadine.